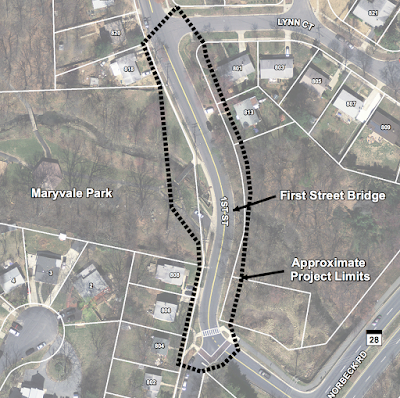 The City of Rockville is preparing to replace the First Street Bridge in East Rockville. Expected to begin last fall, the nearly $1.5 million dollar project has been delayed. The replacement was recommended after an inspection of the bridge by a city consultant in 2012. As an added benefit to the community, a sidewalk will be constructed on the east side of First Street from Lynn Court to the First Street spur road as part of the project. The affected portion of First Street will be closed to traffic during the construction. 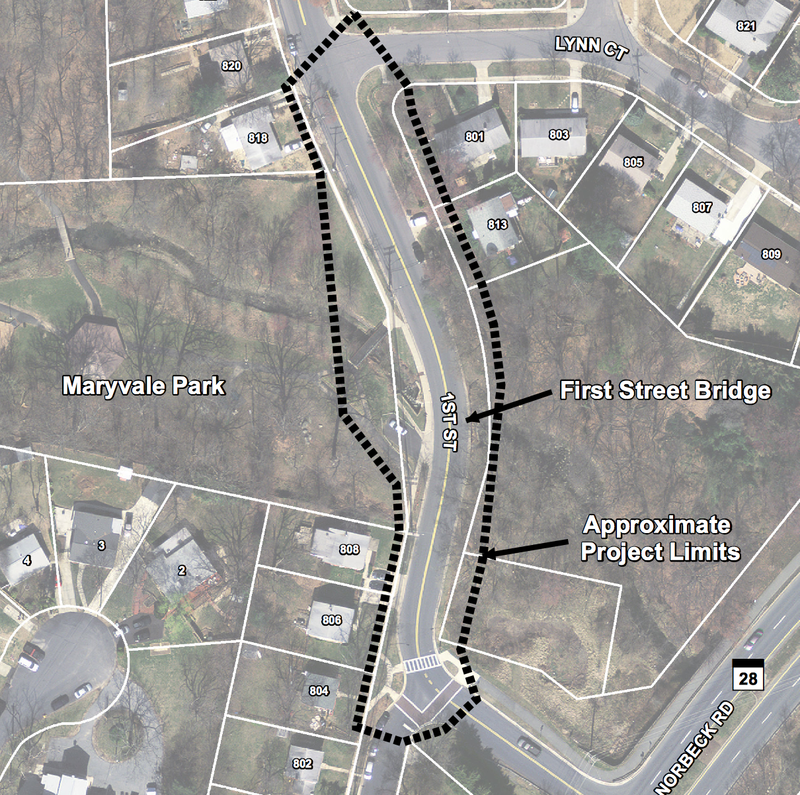 Residents can attend a public meeting tomorrow night, October 1, 2015, from 6:30-7:30 PM, at the somewhat unusual location of the First Street entrance to Maryvale Park. 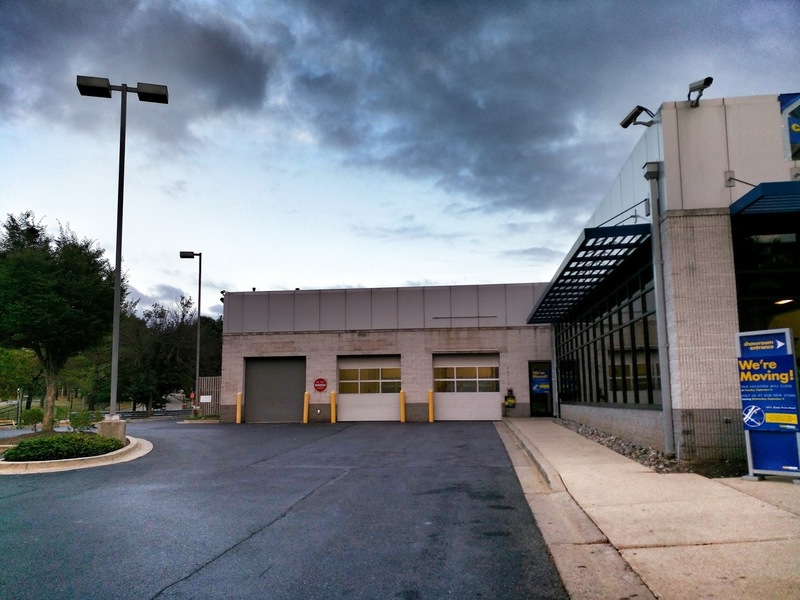 Rockville's Mayor and Council voted unanimously last night to adopt the annexation plan proposed by developers 355 Partners, LLC and Frederick Road, LLC, for a four-acre property at 15931 Frederick Road. 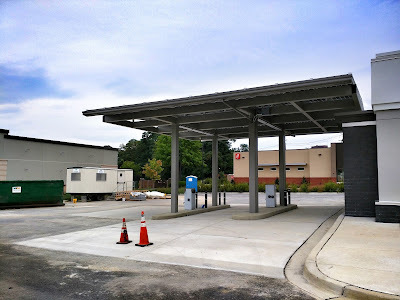 The site is adjacent to the Shady Grove Metro station, and next to the new Bainbridge Shady Grove apartments across Frederick Road from King Farm. It was formerly home to a CarMax auto dealership, which has now moved north to Shady Grove Road. 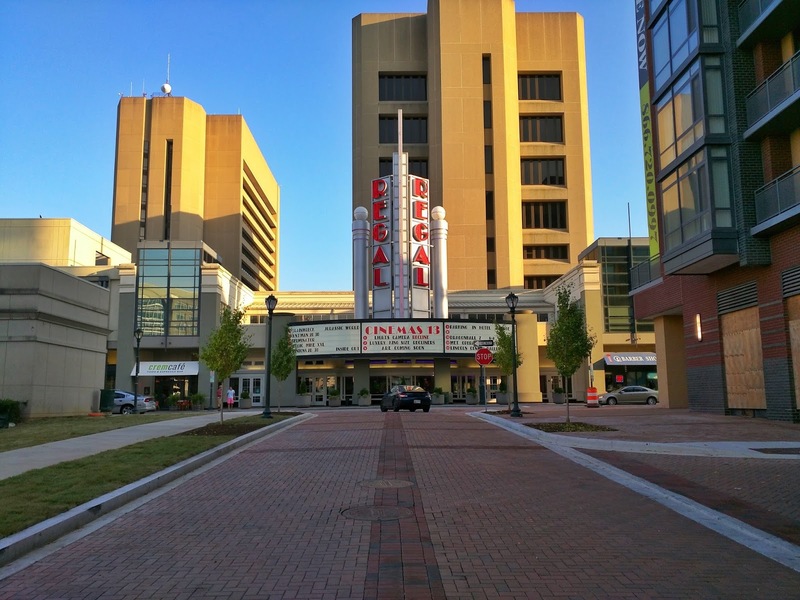 The Rockville Planning Commission recommended the Mayor and Council adopt the plan. Its recommended conditions included capping the height of the future apartment building at 7 stories. Councilmember Tom Moore asked if that made sense for a property by Metro, and whether such a provision would carry over for the site in perpetuity. City Attorney Debra Yerg Daniels said the provision could be limited to the current proposal. Mayor Bridget Donnell Newton asked how tall the adjacent Bainbridge residential building is. Wilson said it is 6 stories tall. Newton said that made a case for keeping the new building at 7 stories. Wilson said that the Mayor and Council didn't need to adopt any of the Planning Commission recommendations at this juncture, advising that those issues could be ironed out at future stages of the annexation process. 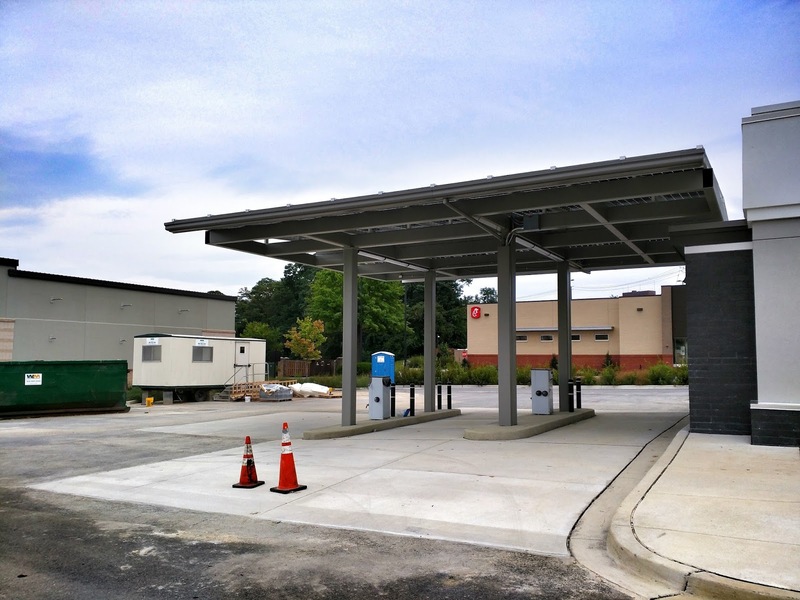 Moore moved to adopt the plan, and revise the fire response data in it to reflect the opening of a new fire station at Shady Grove Road and Darnestown Road. His motion was seconded by Councilmember Julie Palakovich Carr. The plan was adopted by a unanimous vote. A public hearing on the potential annexation will be held on November 16. Eileen McGuckian, Executive Director emerita of historic preservation organization Peerless Rockville, criticized the September 17 vote by the Historic District Commission to allow Montgomery County to relocate the city's Confederate statue at last night's Mayor and Council meeting. McGuckian said the HDC made at least two errors in its decisionmaking process. On the question of whether or not the statue had itself been declared historic, McGuckian said HDC commissioners were misled by city staff, who had said no such evidence could be found. She said that was incorrect, and that the statue had indeed been declared historic in the past. McGuckian also argued that the HDC used the wrong set of the U.S. Secretary of the Interior's Standards in reaching its conclusion. 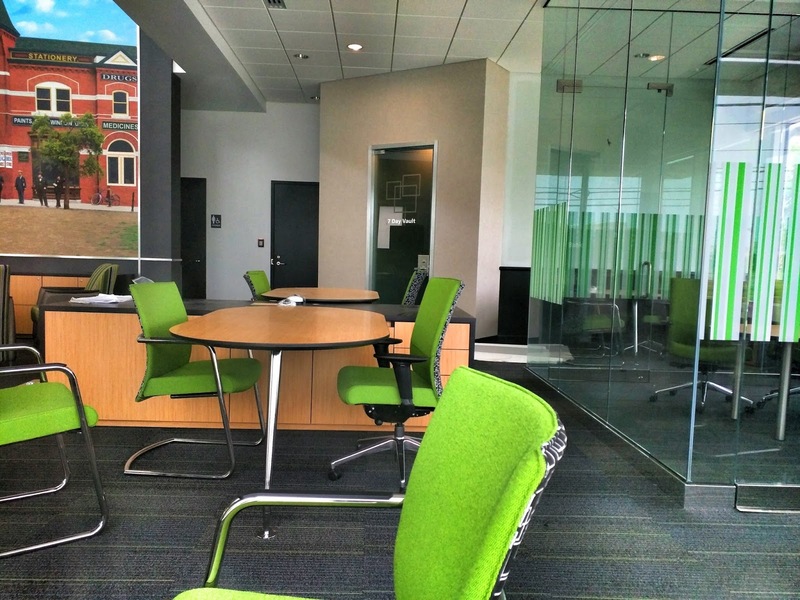 The deadline to file a request to reconsider the HDC decision is October 4, McGuckian said. But the next Mayor and Council meeting is not until October 5. The Mayor and Council couldn't do anything about the matter anyway, Councilmember Tom Moore told McGuckian, as they have no authority to intervene. Mayor Bridget Donnell Newton and Councilmember Beryl Feinberg said they would make themselves available to meet with McGuckian this week to discuss the matter. McGuckian also called for more training for HDC commissioners, whom she said "were clearly uncomfortable with their roles" on September 17. Newton said the Mayor and Council must have a public discussion on a separate issue regarding the statue October 5 - whether or not it will be accepted by the Beall-Dawson House, which is the preferred location by Montgomery County so far. 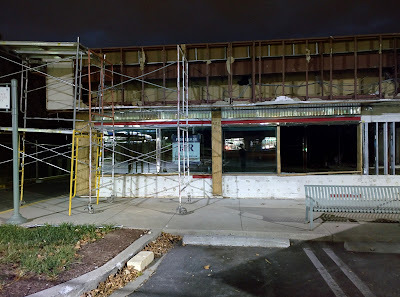 The fate of the diner at Wintergreen Plaza on Rockville Pike is now clear. 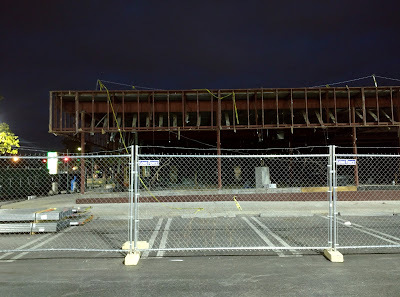 Formerly Ted's 355 Diner, the structure is now being demolished. Conflicting signs of what was pending - construction fencing and dumpster, but also a sign offering the building for lease - had many wondering what exactly the shopping center's plans were for the diner. About the only thing left from the diner is some silver trim along the front of the gutted building. 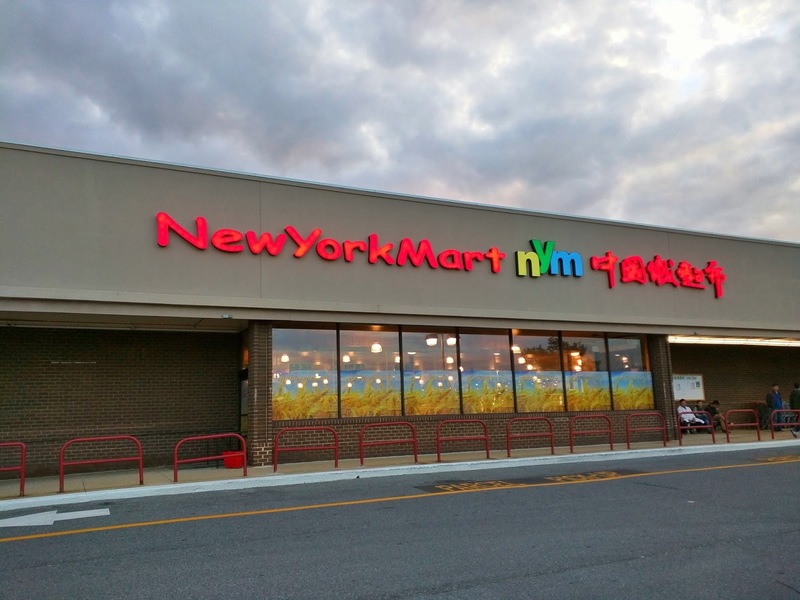 It's been a long road, but New York Mart has finally opened in the College Plaza shopping center at MD 355 and College Parkway. I was out of town for a large part of Saturday when it opened. 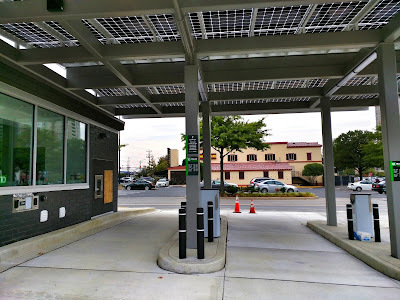 But Rockville City Councilmember Tom Moore was among the first day's customers, and sent several photos (below). I went by yesterday and found the parking lot had many more cars than it has had on a Sunday since Magruder's closed, and quite a few people going into the store. Hours will be 8:00 AM to 10:00 PM, and as you can see in the bottom photo, there will be a prepared food section in addition to groceries. 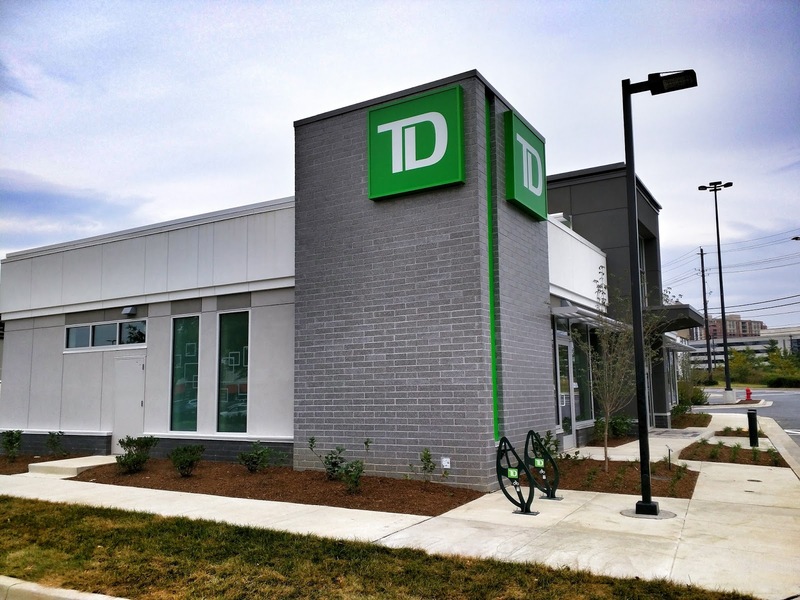 Rockville history buffs may want to attend the Grand Opening of a TD Bank on Rockville Pike this weekend. This new branch is in the Pike District, south of the city boundary. It opens this Saturday in the Montrose Crossing shopping center at 12003 Rockville Pike. 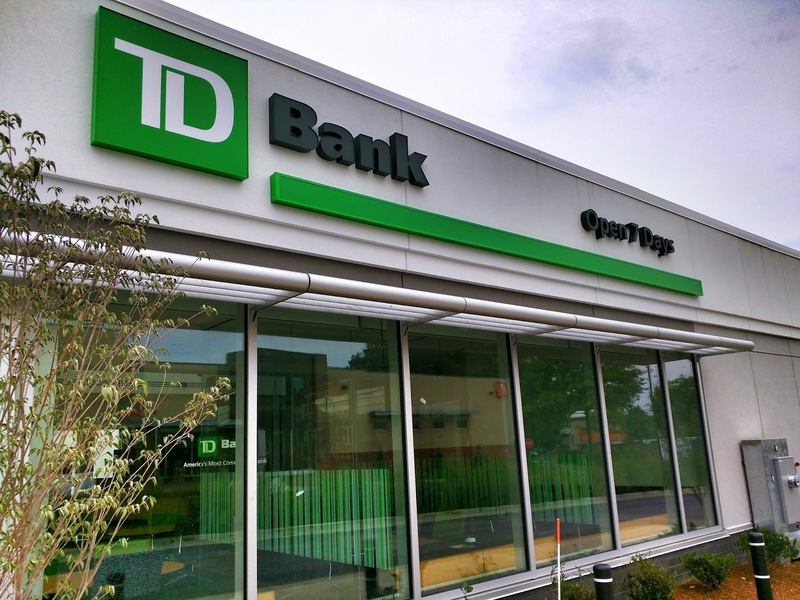 Between 10:00 AM and 2:00 PM Saturday, they'll be providing food, giveaways, "fun and games", and - of course - banking offers. 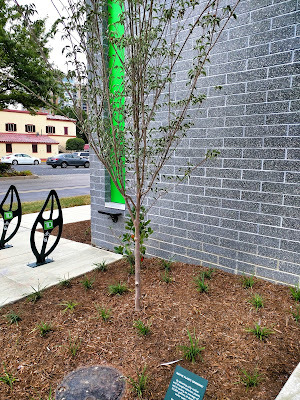 Green features at the bank include solar panels, modern-design bike parking, LEED certification, and native plants growing in the landscaped area outside. The bank also has an interesting easter egg inside that hints at the future of this site, which is currently labeled many things - Rockville by the USPS, North Bethesda by many, White Flint by many others, but newly branded as the Pike District. All of that nomenclature may be irrelevant in the not-so-distant future. That's because there is real potential that the City of Rockville may eventually extend southward to Montrose Parkway, as more unincorporated territory is annexed by the city. The possibility is such that it frequently comes up in discussions of the city's Planning Commission regarding long-range annexation plans. Tour the bank, and you'll find a premonition of that future on display. 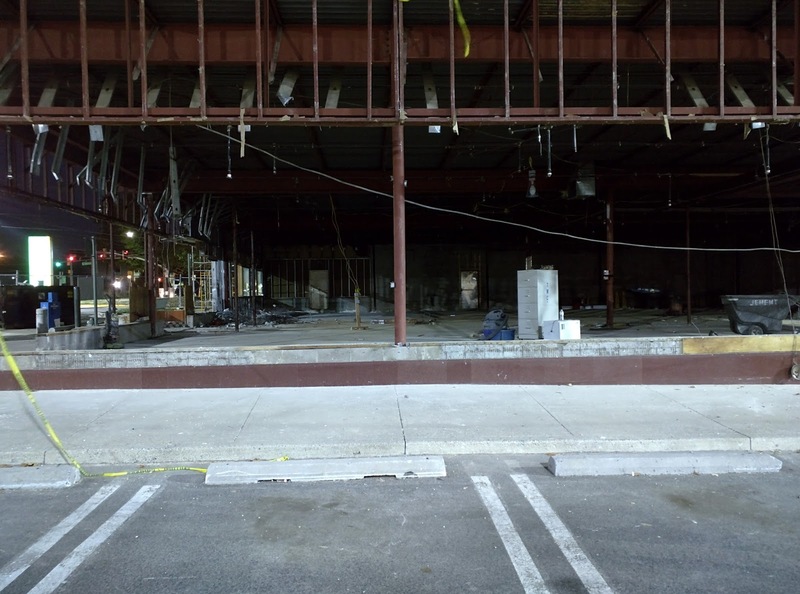 A display recalls a historic drugstore in Rockville's now-demolished and redeveloped downtown. That drugstore was built in the 1880s, and is known to many as Vinson's Drugstore, after it was bought in 1911 by Robert William "Doc" Vinson. 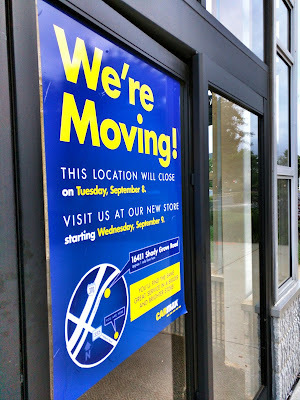 But a previous owner of the store was D.F. Owens. A document on the Rockville website says the drugstore was also a popular gathering place for city politicians, and that President Woodrow Wilson once personally traveled there to buy Wolfhound tablets (they don't say what Wolfhound tablets were, though...). The building was torn down in 1962, and replaced with an office building during Rockville's "urban renewal" craze. 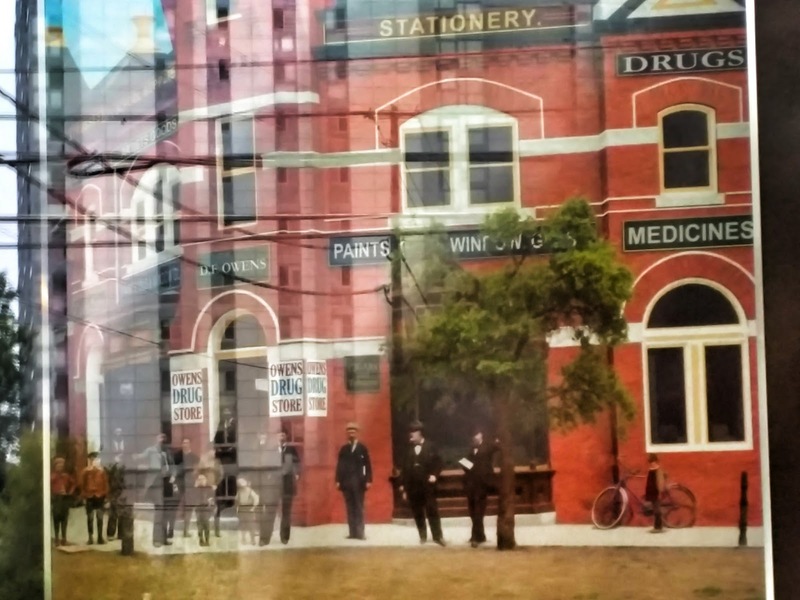 According to Joanna Church of the Montgomery County Historical Society, artifacts from the drugstore can be found today in the Stonestreet Museum and Rockville Memorial Library (which has the store's soda fountain in one of its meeting rooms). Here in this mural inside the bank is Owens Drug Store, as it looked at some point between the 1880s and 1911. 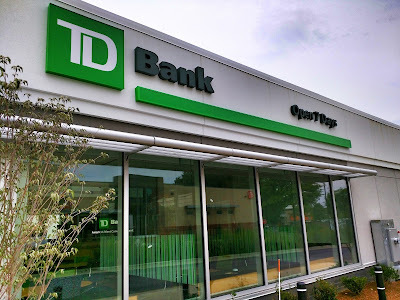 It's particularly interesting because the bank is not near the site of the former drugstore. 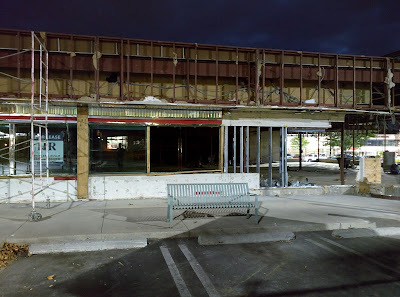 But the bank will now be perfectly positioned if it finds itself annexed into the City of Rockville one day - the historic mural already on the wall in anticipation. 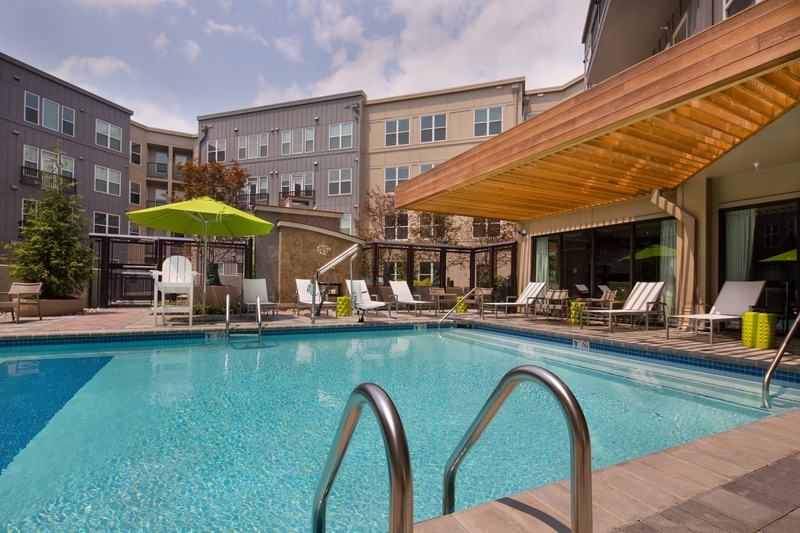 The JBG Companies announced it is pursuing a Gold LEED for Homes certification for its Terano development at 5720 Fishers Lane in Rockville. 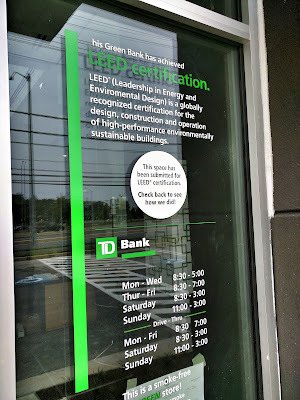 A 214-unit apartment building near the Twinbrook Metro station, The Terano has several features designed to meet the indoor air quality and health standards required for the certification under the LEED for Homes program. These include a no-smoking policy, a mechanically ventilated HVAC system that delivers a constant flow of fresh air, high-efficiency HVAC filters that reduce airborne dust and particles, energy-saving low-emittance windows, low-VOC (volatile organic compounds) paint, adhesives, and Green Label Plus-rated carpet. 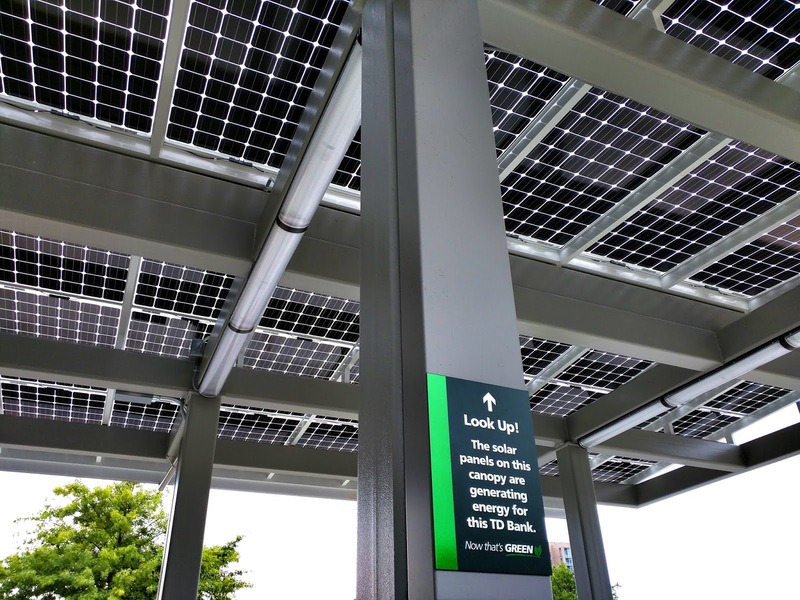 Light-colored roofing cools the "heat island" effect of urban buildings, and Energy Star appliances and built-in Smart Meters add to energy efficiency. This is the first project JBG has applied to the U.S. Green Building Council LEED for Homes pilot program for certification. With about 40 days until Rockville elects its next Mayor and Council, and the first time it will elect them to a 4-year term, the candidate debate schedule is starting to fill up. F. Scott Fitzgerald Theatre, 603 Edmonston Drive. King Farm Community Center, 300 Saddle Ridge Circle. Mayoral candidates are incumbent Bridget Donnell Newton, and challenger Sima Osdoby. Council candidates are Beryl Feinberg, Rich Gottfried, David Hill, Brigitta Mullican, Virginia D. Onley, Julie Palakovich Carr, Mark Pierzchala, Clark Reed, and Patrick Schoof. There are 4 council seats. 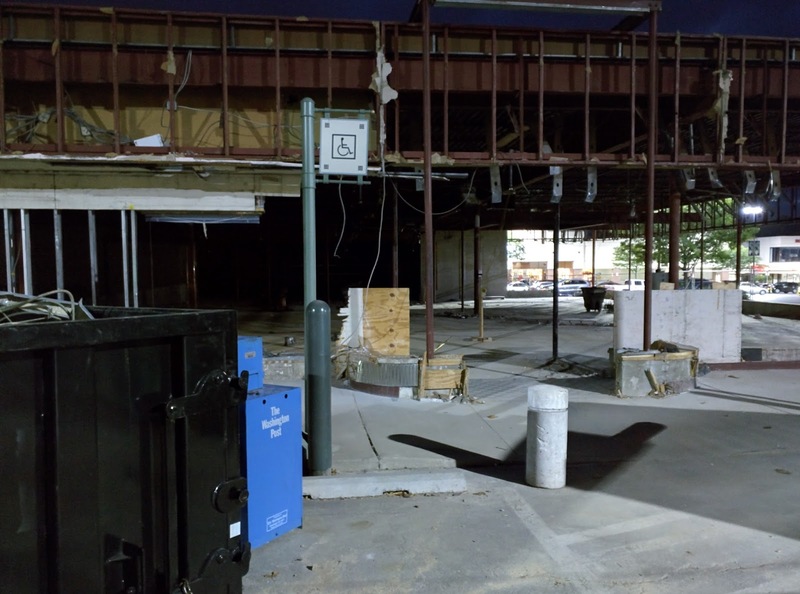 Banning smoking in outdoor areas in Rockville was discussed at last night's Mayor and Council meeting, but ultimately city leaders decided they want the final measure to be more uniform and comprehensive. Councilmember Beryl Feinberg initiated the discussion by asking whether the measure should extend to off-leash dog parks, vaping or e-cigarettes, and asked for more detail on how much signage would cost for the city. 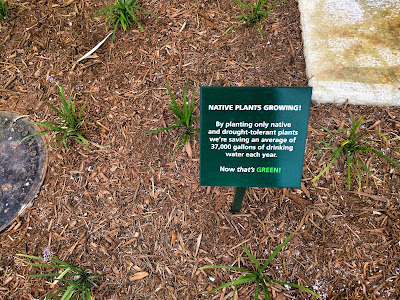 There was also a sense that the city should do more than just regulate smoking in and near parks and playgrounds, or just in Rockville Town Square. When the topic of whether or not the ban could or would apply to RedGate Golf Course was raised, Assistant City Manager Jenny Kimball noted that Montgomery County has not banned smoking at its golf courses. 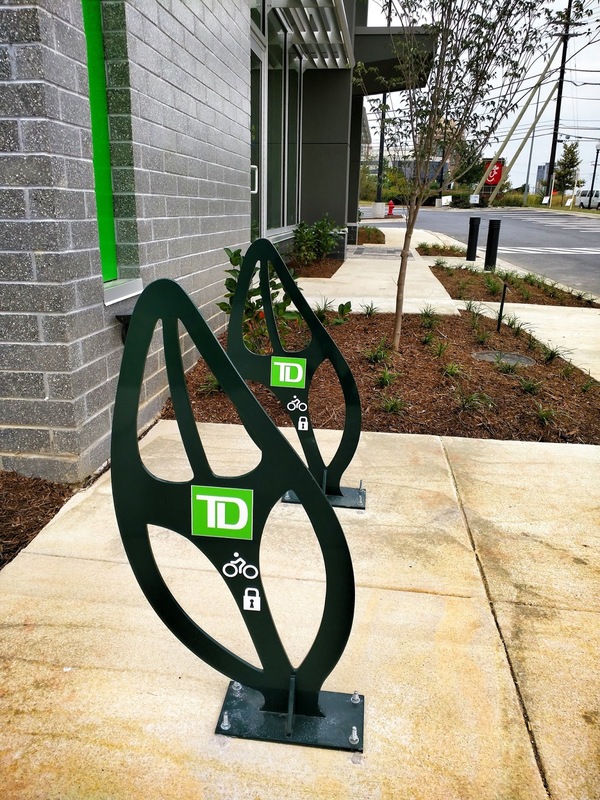 Councilmember Tom Moore felt Rockville should take a bolder approach. "Just the fact that Montgomery County hasn't banned smoking at golf courses does not speak to the health or safety of it," Moore argued. "This is a product that kills people." With a broader measure, Moore said, "Rockville could have a leadership role on this issue." Councilmember Julie Palakovich Carr asked city staff if Rockville's contract with RedGate's management, Billy Casper Golf, would have to be renegotiated. Timothy Chesnutt, Director of Recreation and Parks, suggested such a negotiation would "have to wait until the next lease." Moore strongly disagreed with that, saying that municipal rules can and do change all the time, and that the city would be under no obligation to negotiate with Billy Casper before implementation of any smoking ban. Mayor Bridget Donnell Newton said she also would favor a ban at RedGate, and a citywide ban on smoking in outdoor dining areas, rather than one just in part of the Town Center. Federal Realty, which developed and owns Rockville Town Square, objected to the proposed ban, saying that its restaurant and bar tenants would be at a disadvantage. 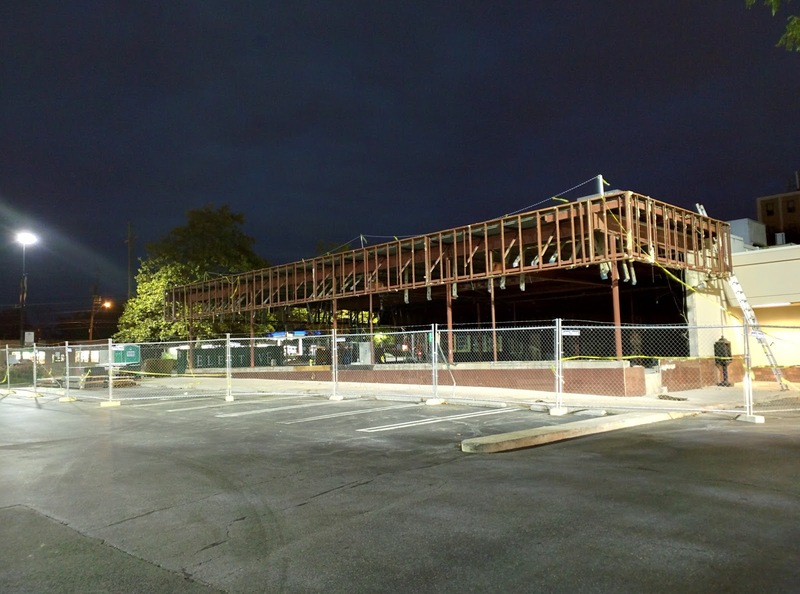 Other restaurants a few blocks away would have been exempt, and there would be confusion over boundaries and enforcement, the developer argued. Moore pointed to the experience of Bowie, where the municipality reported no negative impact on restaurants from a similar smoking ban. Palakovich Carr also said she would support a citywide smoking ban in outdoor dining areas. While there is a clear majority and consensus among the Mayor and Council for taking a bolder approach, Newton suggested holding a public hearing on a final draft ordinance before taking a vote. "To be inclusive, we need to bring the public in," she said, as well as the businesses that would be affected by the change. Staff was instructed to draft an ordinance that would ban smoking in outdoor dining areas citywide, in all city parks, and on the outdoor plaza at Rockville Town Square. 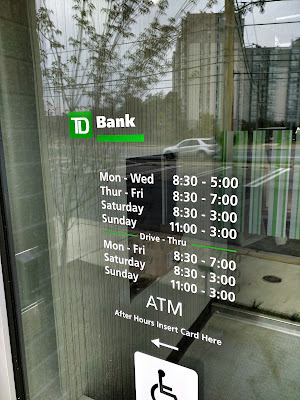 Comments regarding enforcement should be solicited from the police chief, and the cost of signage should be tabulated, as well, before this is brought back for further discussion, the Mayor and Council agreed. 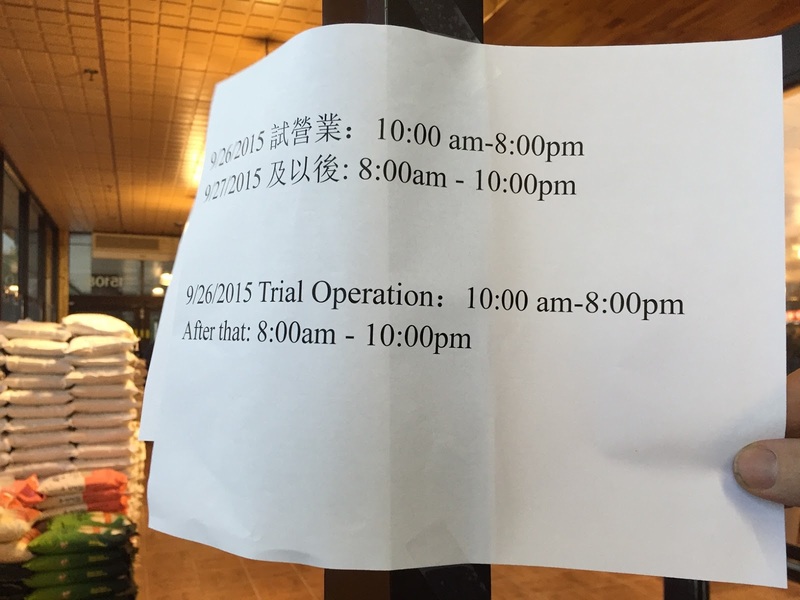 Yesterday I reported on the Montgomery County Task Force shutting off sign-ups for its September 30 public hearing after only a few hours Wednesday. Apparently, some on the task force are incapable of sitting and listening to more than 50 speakers. A supporter of the task force posted a comment on my article, saying the task force shouldn't be expected to listen to citizens until 3:00 AM. 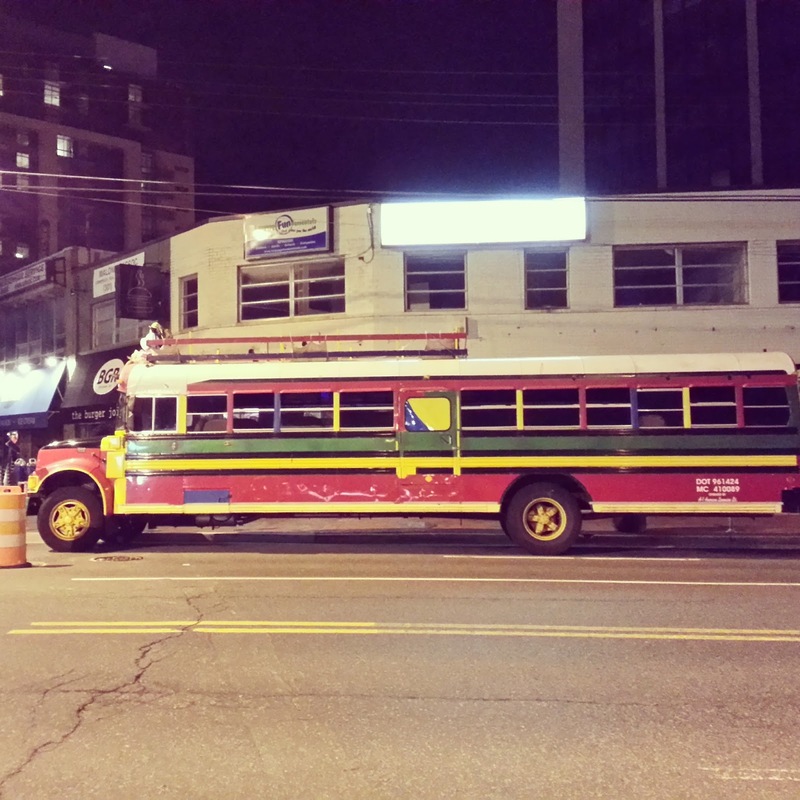 But Wednesday night, the D.C. Council did just that. District of Columbia elected officials held a public hearing from 5:00 PM Wednesday until 3:00 AM Thursday morning, listening to 70 speakers and additional city officials beyond that number. Now, of course, the sensible thing to do in either jurisdiction would be to hold a second hearing, to accommodate the number of residents who wish to comment. But what a great contrast. 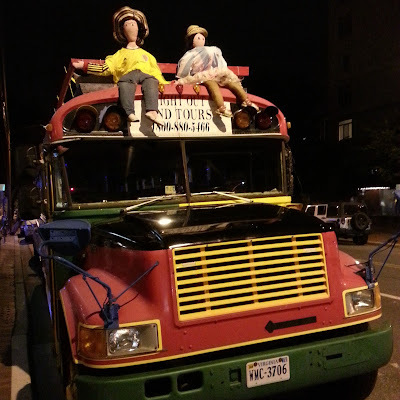 On the same day the task force shut off the phone lines, and shut out citizens to ensure a short evening for themselves (and let's be realistic, to limit the number of negative citizen comments, and make the opposition to the Independent Transit Authority and Bus Rapid Transit appear to be smaller than it is), the D.C. Council put in an all-nighter. The Rockville Historic District Commission voted unanimously last night to grant Montgomery County permission to relocate the Confederate soldier memorial statue from the grounds of the historic Red Brick Courthouse. Commissioner Jessica Reynolds made the motion, and it was seconded by Commissioner Anita Neal Powell. As part of her motion, Reynolds included a request that the new site of the statue be within the City of Rockville, and on public property where it can remain accessible to residents or historical walking tours and other educational opportunities. "We would be fine with that language," Greg Ossont, representing the County's Department of General Services said prior to the vote. The request is not legally binding on the County. Each commissioner made a brief statement, with all supporting moving the statue. Commissioner Craig Maloney noted the statue is "an important piece of our history." 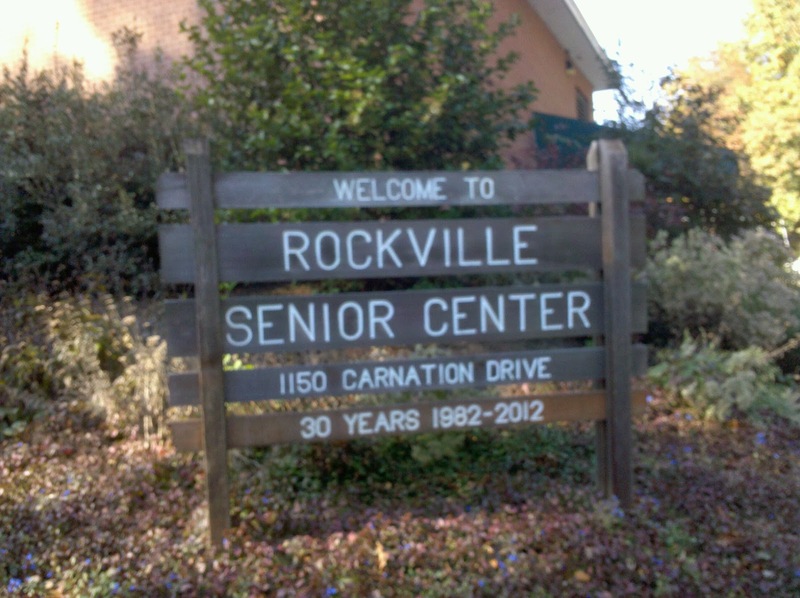 Rockville was indeed a city divided during the Civil War, with a number of prominent residents supporting or even fighting on behalf of the Confederacy. 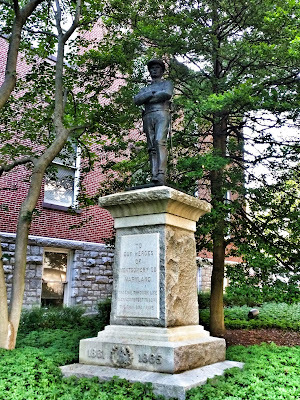 Several notable Confederate figures passed through Rockville during the war. But, Maloney said, "150 years have given us a different perspective." He recalled how the statue had been "defaced with the words, 'Black lives matter.' I would go a step further, and say black values matter. The value of a Confederate statue does not make the [Confederate] cause right or just." Powell concurred. "I cannot support keeping the statue where it is," she said. "When I think of history, I think of that place across from the statue. I can tell you that until the murders took place in South Carolina, many people did not know the statue was there. It just doesn't fit into the history that I know," Powell concluded. Reynolds said that in her personal view, "I would find it hard to support leaving the statue where it is, based on the information we have. However, the statue does have a lot of value in its own right." One positive result of moving the statue, she said, is that it would be better protected from vandalism. Chair Rob Actmeyer said, "Our historic resource is the Red Brick Courthouse" itself. "I don't see how the statue contributes to the Red Brick Courthouse. I agree with Jessica in the sense that the statue has been in Rockville for over a hundred years, [yet] it has not been declared historic." Achtmeyer's assessment did bring a disagreement among several commissioners on whether or not the statue itself was indeed a contributing resource to the site, and whether it therefore deserved historic protection. "It is not directly related to the Courthouse per se," Maloney conceded. But "it is typical of the statues" erected during that time period by Confederate heritage groups. "It is part of that legacy. We have one. It's in the context of the Courthouse, whether we like it or not. Does it deserve some protection as part of that historic site? I don't know. Maybe it does." Perhaps sensing a potential legal argument that could be made, supporters of keeping the statue where it is attempted to share more information with commissioners, but were told they were out of order, as the public comment portion of the meeting had closed. One person made a motion from the floor to reopen it. Achtmeyer could find no support on the dais for doing so, and rejected the motion. With the vote in its favor, the County now has one year to move the statue, and two six-month extensions. If it does not move it before that time, it will have to return to the commission again for permission. Reynolds told statue supporters that this vote wasn't the final word. She urged them to contact the County Executive and County Council and make their opinions known to those who do have the final say on the statue's ultimate fate. The Montgomery County Transit Task Force is at it again, attempting to shut an angry public out of a so-called "public hearing" September 30 at 6:00 PM. To be held once again in the 3rd floor hearing room at the County Council Building at 100 Maryland Avenue in Rockville, the hearing is ostensibly for the public to comment on a Public Draft of the "Report of the Task Force". This document was supposed to be posted on the Transit Task Force website "on or about" September 16, 2015. Then the public was supposed to have a chance to sign up to comment on it. A set of arbitrary rules were imposed prior to the sign-up "window" opening. Members of the public wishing to speak at the forum must sign up between Wednesday, September 16 at 9 a.m. and Wednesday, September 30 at 10 a.m. To register to speak, call 240-777-7165, Monday through Friday, between 9 a.m. and 4 p.m.; TTY users call Maryland Relay. People signing up must provide their name, address and contact information. Those registered to speak may not substitute or cede time to others. A maximum of 50 people will be able to present their views during the public forum. Speakers will have three minutes to make their comments and are encouraged to submit written remarks – which may include additional information and materials. If 50 people sign up before September 30, no additional names will be accepted and there will not be a waiting list. These ground rules were unacceptable and unorthodox in themselves, as is the 6 PM start time, when most citizens are stuck in traffic trying to commute home. Seriously - 50 people can speak, in a county of 1,000,000, on a ton of new taxes that will be paid by residents countywide? Then things went from bad to ridiculous on Wednesday. When I called only a few hours after the phone lines opened, I was told all 50 speaking slots had already been filled. And that my name was being put on a contingency list. 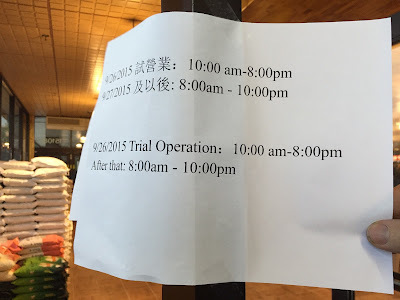 A county public hearing filled and closed to the public after just a few hours on the first day of signups? Outrageous. First, I'd like to see the list of these 50 people, and find out how many of them are from the MoCo political machine, developers and organizations overtly or covertly funded by development interests. But secondly, this arbitrary decision should not be permitted to stand. The taxpayers should demand to be heard at this "public" hearing. If any member of the Transit Task Force is incapable or unwilling to sit and listen to public testimony for as long as it takes, he or she should resign immediately. They are clearly not up to the task the County Executive has charged them with, if that's the case. Even if some on the task force are too lazy to sit in a chair for a few hours to listen to the public, they should at least be scheduling a second hearing, so that those of us citizens who have more energy than they do can testify. The TTF writes that it considered alternative ideas to replace the proposed ITA, and like Bill Clinton's famous "I've worked harder on this than anything I've ever done in my life," reached the shocking, surprising conclusion that what it (and the developers behind the curtain) want - the ITA - remains the only solution. Page 12 contains a laughable argument for Bus Rapid Transit (one of the major reasons the County needs the ITA, as BRT won't qualify for federal funds, and the $5 billion BRT system couldn't be funded without exceeding the Ficker amendment cap on property taxes), claiming it is needed to keep all of the jobs that supposedly will be coming to MoCo from going to other jurisdictions. This argument is preposterous on two fronts. First, the County has failed to attract a single major corporate headquarters in over decade. So, under the current moribund business climate, there aren't any jobs coming. But BRT will allow urban redevelopment of suburban areas like Rock Spring, Wildwood, Georgetown Square, Aspen Hill, etc. Those mixed-use developments will only create jobs for baristas and jeans-folding boutique salespeople. Only a moron would spend $5 billion to attract low-wage retail/restaurant jobs. Finally, the TTF has proposed changes to the ITA bill that will again go to the state legislature in Annapolis in the coming months. It has recommended staggered, 4 year terms for a 7-member governing board for the ITA. Interestingly, it suggests the possibility of term limits, which the County's political machine has fought against for decades for other offices. Is this an acknowledgement that term limits work? Interesting. The ITA would be required to submit its Capital Improvements Program (CIP) budget to the Council for review and approval, as well as the operating budget for the ITA itself, and the transit projects it oversees and operates. Amending the ITA budgets would follow the same process as amending those of County agencies, the report states. 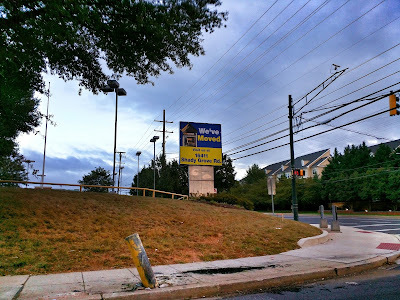 Eminent domain seizures would have to be reviewed and approved by the Council, as well. The report also suggests "that any tax rate set by the authority shall be subject to disapproval by the Council." It should be noted, however, that this current language does not impose the same political disincentive to the Council as the Ficker Amendment cap does for property taxes. Therefore, it would be far less likely that a majority of members would vote to disapprove of the ITA tax rate. The Ficker cap requires all 9 members of the Council to vote for a tax increase over the charter limit. There is also a provision for an "excise tax" "not to exceed 30 cents per gross rentable square foot of leased commercial space, subject to disapproval by the Council." Speaking of the Ficker charter limit cap on property taxes, the TTF says that provision is now outdated, since the state legislature passed the Maintenance of Effort law which requires education funding to be maintained at an equal or higher level each year. It therefore says it favors allowing taxes to exceed the charter limit, but with some restrictions on the amount. It also suggests other sources of revenue that could be substituted for property taxes. Those proposed revenue sources include the aforementioned excise tax, a local-option sales tax, an employment withholding tax, and a congestion tax. Heard enough yet? The report veers back into laughable territory in discussing the serious issue of the higher interest rates the ITA would have to pay for revenue bonds, compared to the lower rate the County could get. Dismissing these concerns, the report says, "if there is such a premium it is likely to be insignificant." Several funding scenarios laid out seem to overestimate federal and state contributions, and lowball construction and operating costs. And all of the taxes suggested are regressive, flat taxes, that would hit lower-income residents the hardest. They want you to pay; they just don't want to hear your response. A standing-room-only crowd packed into the VisArts Kaplan Gallery at Rockville Town Square last night for Mayor Bridget Donnell Newton's re-election campaign kick-off event. Joining Newton were three highly-regarded past mayors who have endorsed her: Jim Coyle, Steven Van Grack, and Larry Giammo. Coyle said he is "confident that under Bridget's continued leadership, we can meet the city's growing needs. This is the time to elect a proven leader, and that proven leader is Bridget." "There was a lot of political gamesmanship in this last term," Giammo said. "Through all of that, Bridget stayed focused on what mattered." 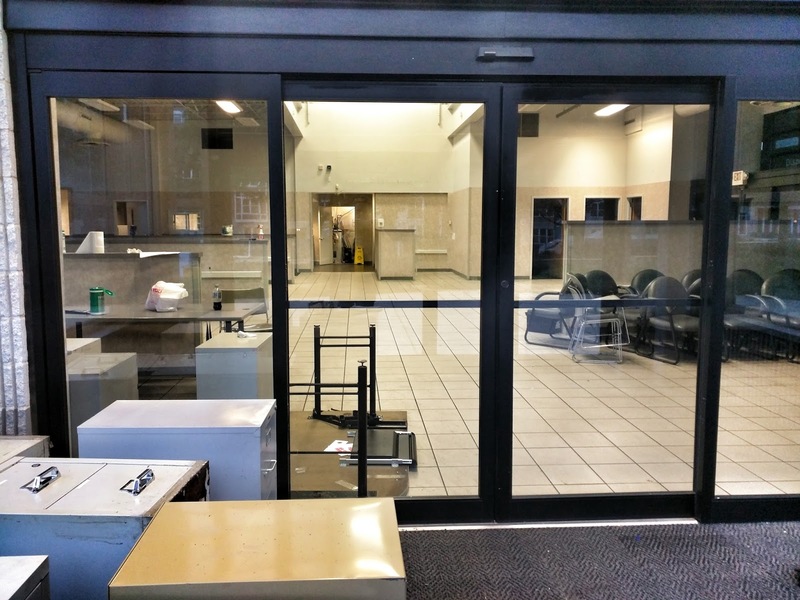 It was during Giammo's time in office that the Mayor and Council passed an Adequate Public Facilities Ordinance that was far stronger than Montgomery County's. The school capacity standards under the APFO were severely weakened by a 3-2 Council vote earlier this year, an action that Newton strongly disagreed with. In her speech last night, Newton said the APFO school standards were "gutted on June 1" in a "back room political deal that was made." 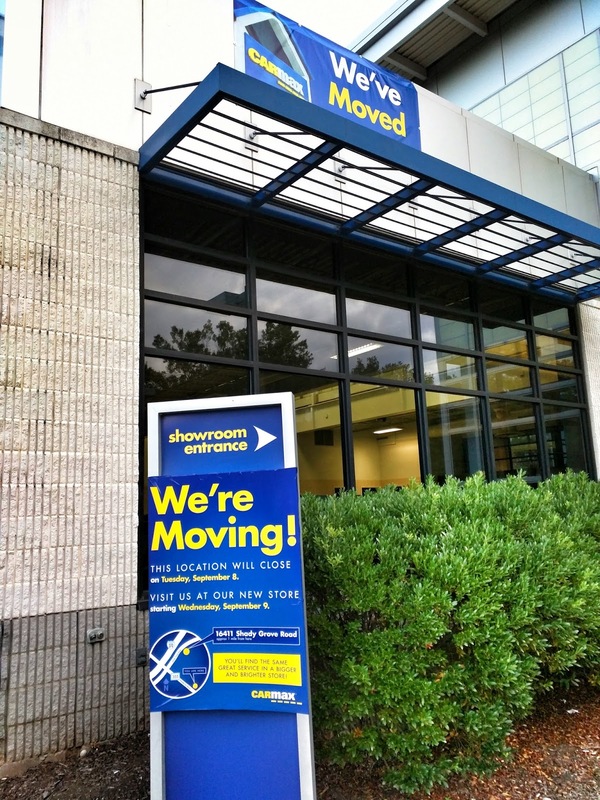 The vote by outgoing Councilmember Tom Moore and current Team Rockville election slate Councilmembers Virginia Onley and Julie Palakovich Carr "eviscerated the only tool we had in our toolbox," Newton said. With the entire city now free of any development moratorium, but classrooms still as crowded as before, Newton predicted a "Katie bar the door" wave of development ahead. "It's going to be unbelievable." In that context, Newton argued it will be essential to ensure that Richard Montgomery Elementary School No. 5 is built to full capacity. She also called for the hiring of more city police officers, noting that the ratio of officers-to-residents is far lower than in comparably-tiny Easton, MD, which has only 16,000 residents. But Newton also decried the current political atmosphere in Rockville. She fired back at Team Rockville's assertion that she failed to generate consensus on issues, noting that she was able to make allies on the Council despite being the only member not part of the 2013 Team Rockville slate. One of those allies, Councilmember Beryl Feinberg, was in attendance at last night's event. 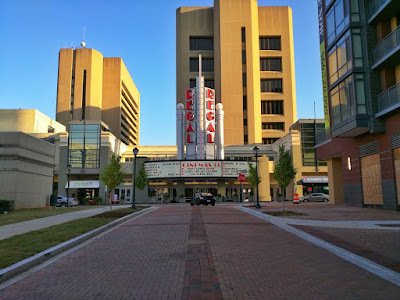 Newton also disputed Team Rockville's bleak assessment of Rockville Town Center. "Rockville is doing very well," she said, noting that several restaurants and bars will be opening soon at Rockville Town Square, and that the Duball development across the street has attracted several tenants, including World of Beer and Panera Bread. 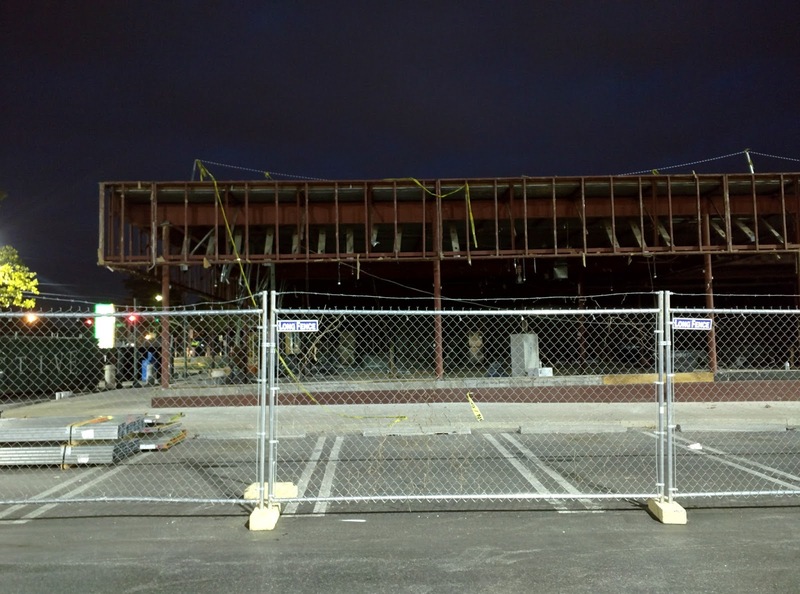 A groundbreaking will be held at the Kettler development across Beall Avenue from Rockville Town Square in a few weeks, as well. The new Cambria Suites hotel "is booked solid almost every weekend," Newton reported. On the personal side, Newton said she has "a strong distaste for the politics of today. I strongly, strongly object to the way the conversation is going in our city, in our state, and in our country." 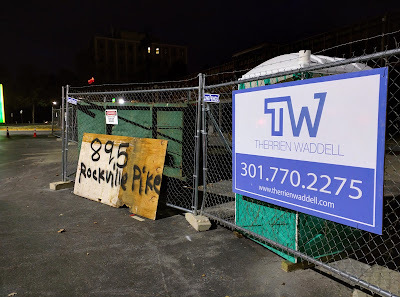 The mayor recalled a recent blog post by the campaign manager of Team Rockville that described her as "a homemaker, as though that was an insult." The post angered many of her supporters. Newton said that in 2015, people should be celebrating individuals for "the choices they make, not putting labels on them." In addition to a wide variety of leadership and public services roles she has held, Newton said her role as a parent gave her a set of skills that comes in handy in city politics. "There is no difference between a 2-year-old having a meltdown than dealing with a councilmember having a meltdown. With one, it's age-appropriate," she added to raucous laughter from the crowd. She urged the crowd to focus in the next 6 weeks on "who will champion what is great about this city," and said having independent voices on the council would be an advantage. To that end, she invited the independent candidates for City Council - Beryl Feinberg, Rich Gottfried, David Hill, Brigitta Mullican and Patrick Schoof - to her event. The remaining candidates are on the Team Rockville slate: Sima Osdoby for Mayor, Onley, Palakovich Carr, Mark Pierzchala and Clark Reed. 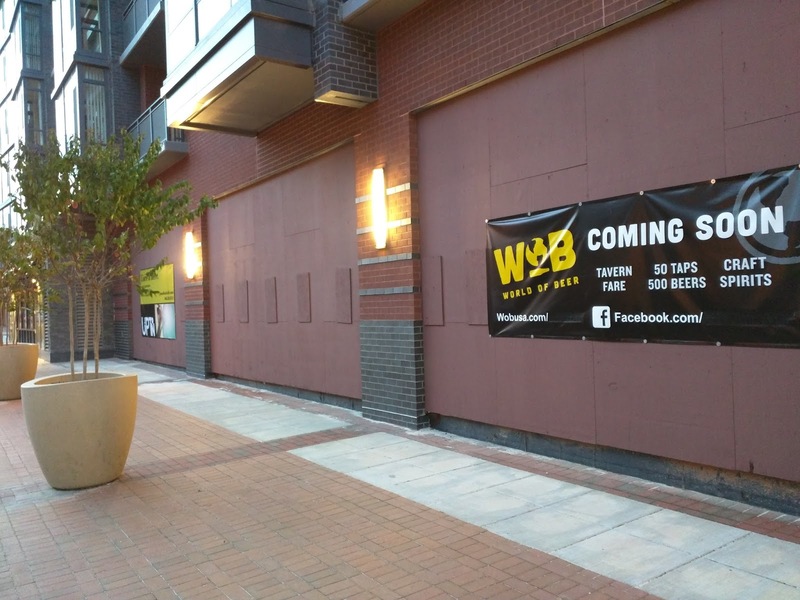 An upscale new entry in the Rockville dining scene wants "to give our guests the best." That means your sushi roll on any given day at Stanford Grill may hold bluefin tuna caught off the coast of Japan. Or you might order a Westeross from Scottish waters, which Executive Chef Sean Kinoshita calls "the Kobe beef of salmon." Your sizzling steak will be USDA Prime or 1855 certified Angus beef. 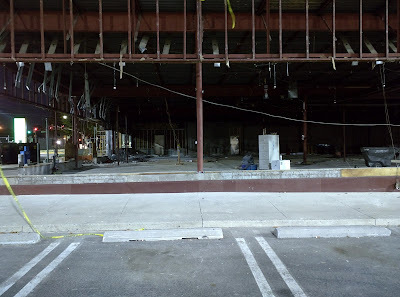 All of these menu selections are part of Stanford Grill's effort to provide an upscale dining experience, which will also include a live piano bar, glassed-in in-house bakery and outdoor patio with fire pit. 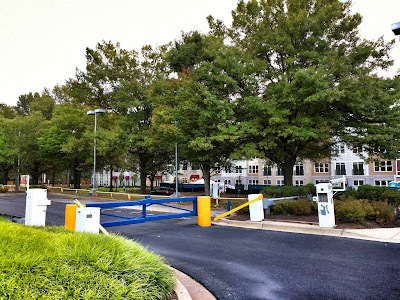 You'll even have your own parking garage entrance at Stanford Grill's home, the Tower Co. office building at 2000 Tower Oaks Boulevard. 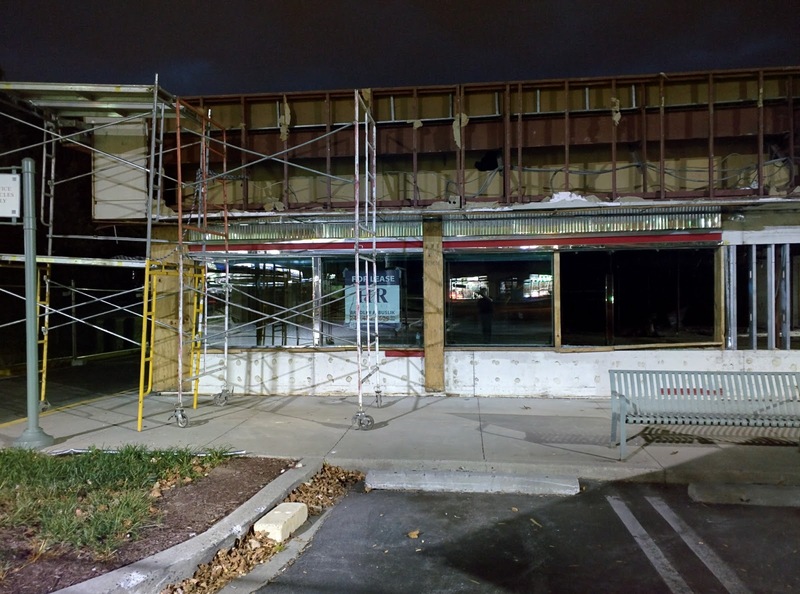 This second Stanford Grill outpost will fuse the familiar-but-premium American comfort food of the existing Columbia, MD location with the world-class sushi of Kinoshita, who comes to Maryland from the acclaimed Tao Asian Bistro in Las Vegas. Coming from the over-the-top Vegas tourist scene to the peaceful suburbs of Montgomery County hasn't been as hard of a transition for Kinoshita as you might expect. In Sin City, "we kind of focused on us. We didn't really worry about what other people are doing," Kinoshita recalled in an interview Tuesday at the restaurant. Vegas was about volume, he said, and this large space at Tower Oaks is designed to hold 300 in its main dining room, with another 100 on the patio. There's also a private dining space that can hold 24. The chef said his ability to adapt to high-volume service, and work under pressure, allowed him to take on what other chefs might find too ambitious of a venture here. But sitting in the dining room as workers put the finishing touches on the decor and assembled furniture, Kinoshita marveled that "this is probably the most beautiful restaurant in Montgomery County." Of course, the design can only go so far. What will be on the plate will matter most. "I think we'll surprise people with the sushi," Kinoshita predicted. Being born and raised in Hawaii, where Japanese residents and tourists demand the highest quality in sushi, has been the perfect preparation for his ventures on the mainland U.S., where Kinoshita has managed sushi bars for 15 years. The rolls getting the biggest raves among early taste testers so far? Yellowtail with cilantro and jalapeños, and the Coconut Shrimp Roll. For those who prefer turf to surf, Stanford Grill is offering meats from a wood-burning grill. The booth-heavy seating configuration - and live musicians who have performed with greats like Eric Clapton and Tony Bennett - will combine with the carefully-sourced beef to create a bit of a steakhouse aura familiar to power lunchers and diners in the District. "The menu is American comfort food," Kinoshita noted. "The food is recognizable." Not every steakhouse has its own bakery, though. Stanford Grill does. Unlike even some of the best dining destinations in the area, diners here will know that their bread and baked goods were made that morning, in the restaurant. While there may be a bread basket in the future, right now the bakery's output will be found in the bread on your sandwich, the bun on your burger, or on the dessert menu. Key lime pie, flourless chocolate cake, and seasonal cheesecakes are some of the classic items found on the dessert menu. But don't forget the "monster-size" bread pudding Kinoshita said "people drive miles for." What about the libations? 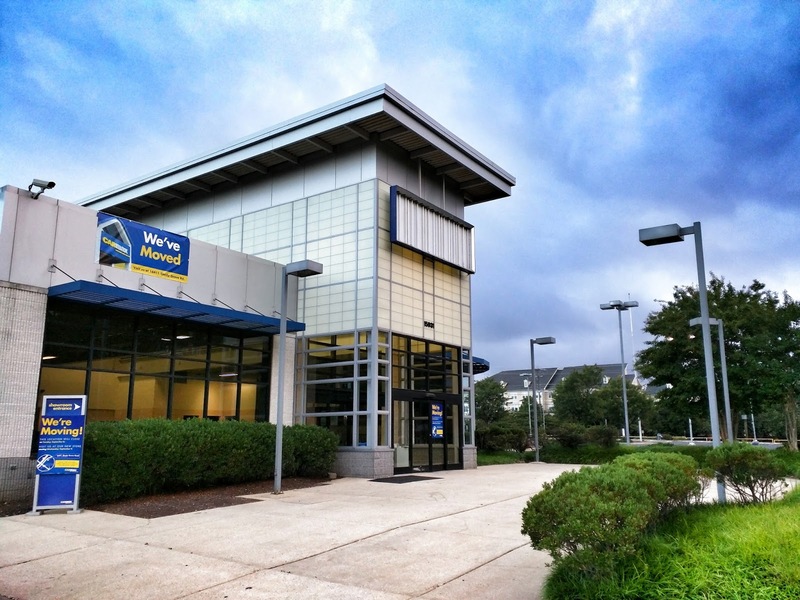 Assistant General Manager Phil Guernsey said they'll do their best to provide a diverse selection, despite the notoriously-difficult Montgomery County liquor regime. 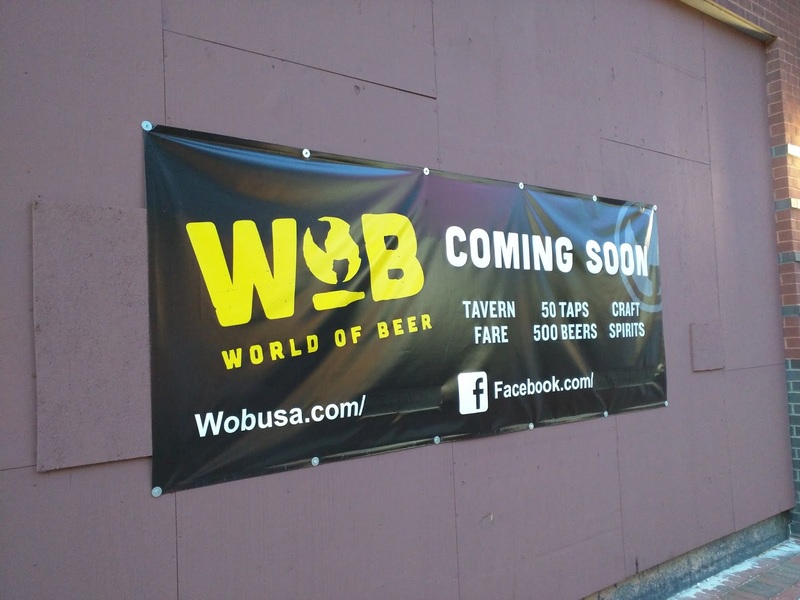 The sleek bar will host 5 taps, which will include a rotating selection of D.C. Brau and Laurel's Evolution brews. 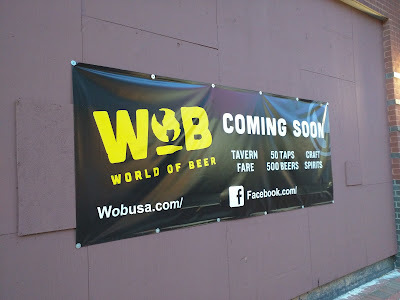 There will be standbys like Stella Artois, Yuengling and Blue Moon. But also local seasonal bottles like Evolution's Jacques Au Lantern. The initial wine list will be California-heavy, Guernsey said, but also have some selections from France and Italy, including one rosé and one sparkling wine. A handcrafted list of 14 cocktails will lean toward classic concoctions, while emphasizing freshly-squeezed juices and naturally-infused vodkas in drinks like a fresh honeydew martini. 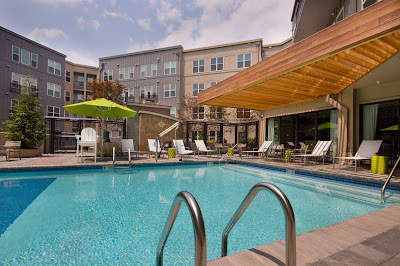 While the patio is surrounded by suburban green space and a fountain, the site is easily accessible from I-270 by taking the Tower Oaks branch of the Montrose Road exit. Those who take the off-ramp will find "great service, quality food and a great setting," Kinoshita promised. "We don't promise anything other than a great experience, and consistently great food. And everything is reasonably priced."